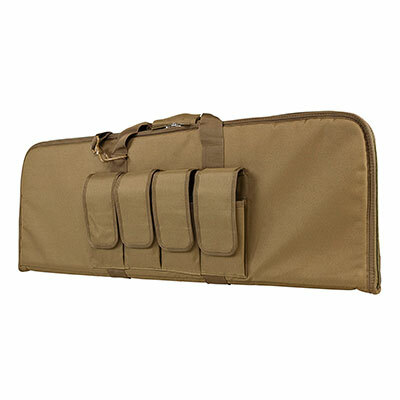 - 2960 series Carbine Gun Case is designed for carbines that are less than 36" in overall length. This gun case has many popular features like heavy duty zippers that are lockable, four external magazine pouches, padded carry handle, and adjustable shoulder straps. This is a great case for protecting and transporting carbines to the range. - Rectangular Padded Gun Case. - Four External Rifle Magazine Pouches with individual magazine flaps with hook and loop fasteners. - Heavy Duty zippers that have metal zippers that can be locked with a small pad lock. Pad lock not included. - Padded carry handle straps and a shoulder sling is included. - Exterior material made with tough and durable PVC material that is water and chemical resistant. - Rectangular shape makes the carbine gun case a little more discreet. - Exterior Dimensions: 36.0" L x 13.0" H.